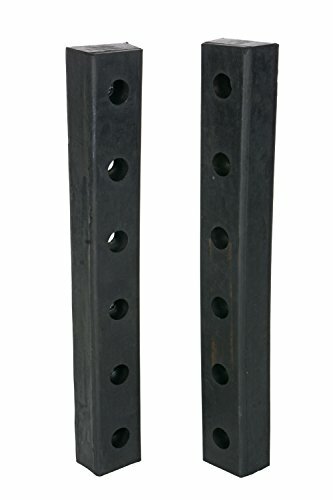 This Vestil DBE-30-2 vertical bumper measures 30" in height, 4-1/2" wide, and is used to prevent damage by a vehicle to a loading dock, building, or equipment and comes in a pack of two. The pad has a depth of 3" and is made of molded rubber for elasticity and resistance to impact. It is fabric-reinforced with nylon and polyester for strength and dimensional stability. This loading dock bumper has pre-drilled, countersunk 3/4" mounting holes for easy installation, with steel rings molded inside for reinforcement.